Common Names: Pacific nurse shark, nurse shark, Eastern Pacific nurse shark, cat shark, tiburon gato. Identification: Uniformly brown or grayish brown body, paling slightly towards belly. Two dorsal fins of almost equal size close to tail. Head bulbous with small mouth. Mouth has a barbell on each side. Tail narrow with a large upper caudal lobe and no distinct lower lobe. 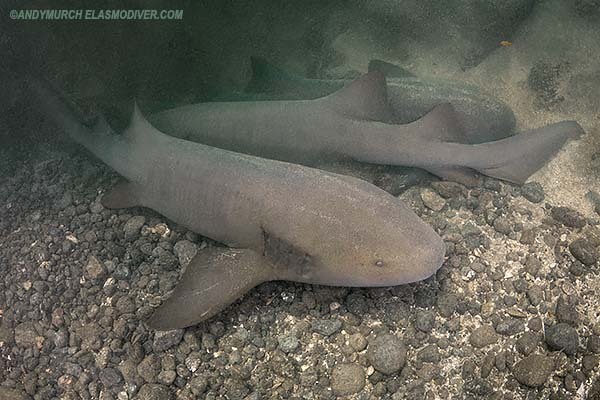 The Pacific nurse is very similar to the more widely distributed Atlantic nurse shark. This species differs from Ginglymostoma cirratum between the posterior end of the second dorsal fin and the beginning of the caudal lobe, both being shorter; the new species also differs by the position of the insertion of the first dorsal fin with regard to the pelvic fins and in the form and number of keels on the dermal denticles and teeth morphology. Size: Maximum recorded size 2.8m but may exceed 3m. Habitat: Found around rocky reefs from intertidal to at least 30m. Distribution: The recorded range of the Pacific Nurse Shark is from the Sea of Cortez to Peru but it is more common in the centralk part of its range around Panama and Costa Rica. Behavior: Nocturnal. Sleeps under overhangs of reefs, or in mangroves during the day. Often found sleeping in small groups. At night forages for spiny lobsters, crabs, octopus, and sea urchins etc. Conservation Status: Not yet assessed by the IUCN but the Pacific nurse shark is extremely scarce in comparison to its Atlantic cousin. Although it is not directly targeted due to its paucity, the Pacific coast of Central America is heavily fished so it is likely that when assessed, this shark will eventually be listed as vulnerable if not endangered. Photographs: Playa Del Coco, Costa Rica. Similar species: The Pacific nurse shark is the only member of the nurse shark family found in the Eastern Pacific and the only large brown shark with barbells in the region. Reports of Atlantic (common) nurse sharks Ginglymostoma cirratum from the Eastern Pacific are misidentifications of Ginglymostoma unami. Reaction to divers: Much shyer than its Atlantic congener, probably due to its lack of contact with divers. Often bolts when approached but may allow divers and photographers to settle next to it if approached slowly and in a non-threatening manner. Diving logistics: The Pacific nurse shark can be encountered by divers in Playa Del Coco at a dive site called the Washing Machine. This is a shallow site at Isla Catalina where up to a dozen or more animals congregate in a small hole in the reef. Likely, they remain in this surge swept area because it is noticeably warmer than deeper sites nearby. Unfortunately, the dive site is heavily affected by the omnipresent Pacific swells so it is difficult to reach unless conditions are very good. Even then, visibility can be poor, and the sharks tend to bolt almost immediately. The nurse shark aggregation at the Washing Machine was only recently discovered so it is unclear if the sharks utilize the site all year long or if they remain there only when the surrounding water is too cold. Six sharks were present when I dove at this site in March 2019. 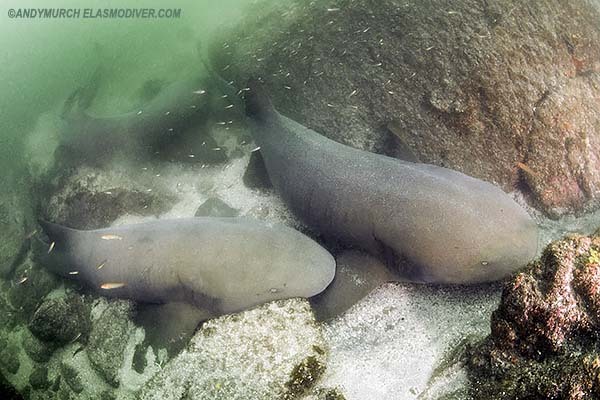 The Pacific nurse shark can also be encountered during the warmer months at one or two sites around Coiba Island in Panama. Flores, Luis Fernando & Ramírez-Antonio, Emmanuel & Angulo, Arturo & León, Gerardo. (2015). Ginglymostoma unami sp. nov. (Chondrichthyes: Orectolobiformes: Ginglymostomatidae): una especie nueva de tiburón gata del Pacífico oriental tropical. REVISTA MEXICANA DE BIODIVERSIDAD. 86. 48–58. 10.7550/rmb.46192. Rosa, R.S., Castro, A.L.F., Furtado, M., Monzini, J. & Grubbs, R.D. 2006. Ginglymostoma cirratum. The IUCN Red List of Threatened Species 2006: e.T60223A12325895. http://dx.doi.org/10.2305/IUCN.UK.2006.RLTS.T60223A12325895.en. Downloaded on 02 April 2019.